Let's take a moment to appreciate the premade puff pastry. Taxi cab confession: Before now, I had never made a tarte tatin. It sounded just plain scary – flipping a pan over so that the fruit ends up on top and the crust ends up on the bottom. Such drama! Why would anyone put themselves through such angst? But there I was just minding my own business, and suddenly it was pear season, and the voluptuous, colorful, squatty fruits were everywhere. I bought some puff pastry, gave myself a big old pep talk, and turned up the music. An hour later, my first pear tatin was a success. A few pears stuck to the pan when I inverted it, but I pulled them off and settled them back into place on the tarte, and no one was the wiser. You want your pears to be just ripe, but not soft. They need to hold their shape in the baking. 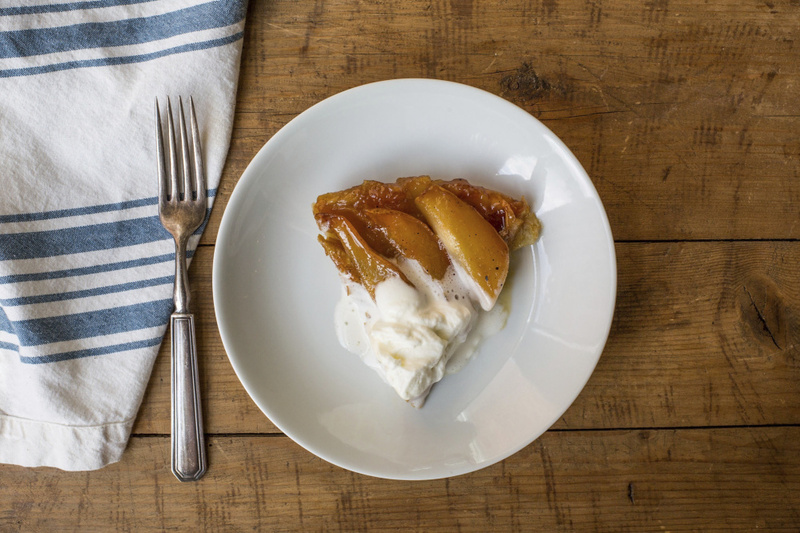 Buy yourself some good ice cream for this – you and your tarte tatin deserve it. In closing, I take a moment yet again to profess my abiding love for premade puff pastry. I may be excited to add tarte tatins to my repertoire, but I’m pretty far away from wanting to make my own puff pastry. In a 10-inch, heavy ovenproof skillet, preferably cast iron, stir together the sugar with 2 tablespoons of water. Cook over medium heat, without stirring, until the mixture starts to turn a golden color, about 6 minutes. Stir in the butter, and continue stirring occasionally until the mixture is a rich golden color, but not too dark. Stir in the lemon juice. While the sugar mixture is cooking, slice the pears in half, then into quarters, remove the cores with a paring knife, and cut the halves lengthwise into two thick slices each (so, eight slices total per pear). When the sugar mixture is golden, arrange the pear slices in concentric circles in the pan. Reduce the heat to medium low and cook until the pears are slightly tender, about 3 minutes. Meanwhile, lightly flour a clean work surface. Roll out the puff pastry to a square slightly larger than the pan’s diameter. Trim the pastry into a circle just barely larger than the circumference of the pan, and prick the puff pastry in several places with a fork. Place the pastry over the pears and carefully tuck the edges around the tops of the pears (you may want to use a rubber spatula, as the pan will be hot). Bake for about 25 minutes until the pastry is golden brown and puffed. Place the pan on a wire rack and let cool for 15 minutes. Run a knife around the edge of the skillet, place a serving plate (larger than the pan) on top of it, and carefully invert the tarte tatin onto the plate. If any pears cling to the pan, remove them and place them back in their rightful spots. Let cool a bit more, and then serve warm, with ice cream or sweetened whipped cream.